After nearly two years of Passing of the Pioneers, I am beginning to have to dig a little deeper for pioneer obituaries but I have managed to find an interesting group for January. There are members of the Black, Herbertson and Guthridge families. Also a butcher, a baker and a newspaper maker. Then Sarah Jane Wadmore, an early Portland historian, and Mary Ann Skilbeck, a member of a family that left a legacy of value to historians today. Don’t despair, there will still be more Passing of the Pioneers and if the Hamilton Spectator ever finds its way to Trove, well, my life will be complete. Thomas Edwin THOMAS: Died 21 January 1909 at Casterton. Thomas Thomas was the owner of the Casterton Free Press and a former owner of the Port Fairy Gazette and was well-known for his journalism. Mary FERGUSON: Died 24 January 1910 at Casterton. Arriving at Portland in 1861, the Dewars headed to Heathfield Station near Strathdownie where they were both employed. Later they moved to Casterton until their deaths. Mary had nine children and lived to eighty-four years. Thomas MORRISSY: Died January 1914 at Beeac. Tipperary born, Thomas Morrissey arrived in Victoria around 1860 and farmed around Ballarat. After two years, he moved to Beeac where he farmed for the next fifty-two years. 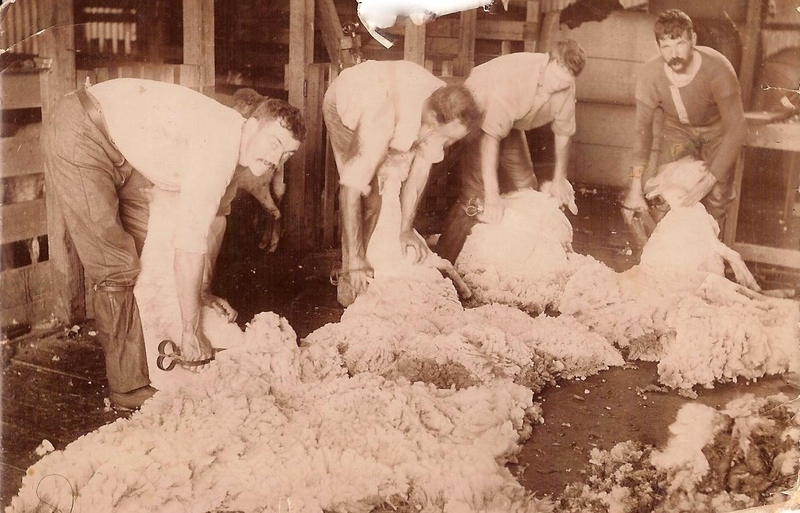 He was a member of the Colac P & A Society and took a keen interest in the affairs of the Colac Dairying Company. Mary GREENHAM: Died 5 January 1915 at Casterton. Mary Greenham was born in Middlesex in 1833 and arrived in Victoria in 1854. She was a Casterton resident from 1855 to 1875, then Corndale for the next thirty-five years before returning to Casterton in the years before her death. With her husband George Sealey, they had a family of nine sons. One son lost his life during the Boer War. She left fifty grandchildren and twelve great-grandchildren. Patrick KINNANE: Died 9 January 1915 at Port Fairy. A Koroit resident for many years, Patrick Kinnane was born in Limerick, Ireland around 1827. He arrived in Portland about 1854 and worked for the Koroit Borough Council. He had a large family of four sons and five daughters and was buried at the Tower Hill cemetery. Mary Ann SKILBECK: Died 22 January 1915 at Port Fairy. Back in the 1990s, I read The Diaries of Sarah Midgley and Richard Skilbeck: A Story of Australian settlers 1851-1864, edited by H.A. McCorkell. It has a lot of Port Fairy and the Wesleyan Methodist Church, both relevant to the Harman family. Mary Ann was a sister of Richard Skilbeck, and she married William Midgley, the brother of the other diarist, Sarah Midgley. This was a great read, giving an insight into pioneering life in the south-west of Victoria. Finding Mary Ann’s obituary has reminded me I must read it again. It is available online via the Midgley family website, but I think I’ll wait until I get the hard copy from the library. The website does have a lot of both the Midgley’s and Skilbecks for those interested. Agnes Jane TODD: Died 5 January 1917 at Casterton. Agnes Todd married Herbert Lewin in 1882. John TOOGOOD: Died 18 January 1917 at Hawkesdale. John Toogood was born at Princess Bridge, Melbourne in 1840. He married, for the first time, at Richmond in 1862 and he moved to Port Fairy in 1864. He then moved to Winslow near Warrnambool where his wife died. On to Hawkesdale where he ran a carrying and contracting business for some years before he turned to farming pursuits. He married a further two times, but both wives predeceased him. 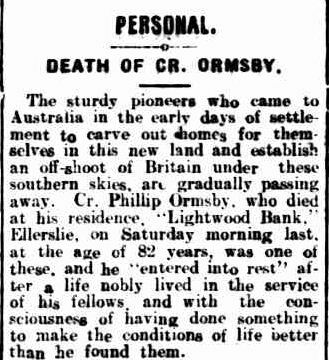 Phillip ORMSBY: Died 12 January 1918 at Ellerslie. Phillip Ormsby was born in Dublin and enrolled in the Dublin University to study medicine. His sense of adventure saw him leave his studies and sail to Melbourne on the large clipper, Champion of the Seas in 1854. He got his land legs in Geelong, then he went on to the goldfields at Ballarat for three years, farmed at nearby Learmonth and then purchased land on the banks of the Hopkins River near Ellerslie in 1865. Like, Archibald Black (above), Phillip was remembered as one of the first to see the potential for dairy-farming in the area. He was one of the co-founders of the Western District Co-Operative Factories Company and served on the Mortlake Shire Council with two years as President. He was also secretary of the Mortlake Cemetery Trust. Phillip married Jenny McKellar and they had four sons and seven daughters. Phillip died with the knowledge that is son was killed in France only months before. Jane ARMSTRONG: Died 29 January 1920 at Hamilton. Jane Heaney was one of Condah district’s oldest residents. She arrived from Ireland with her husband, Robert Heaney in 1856 aboard the General Hewitt. 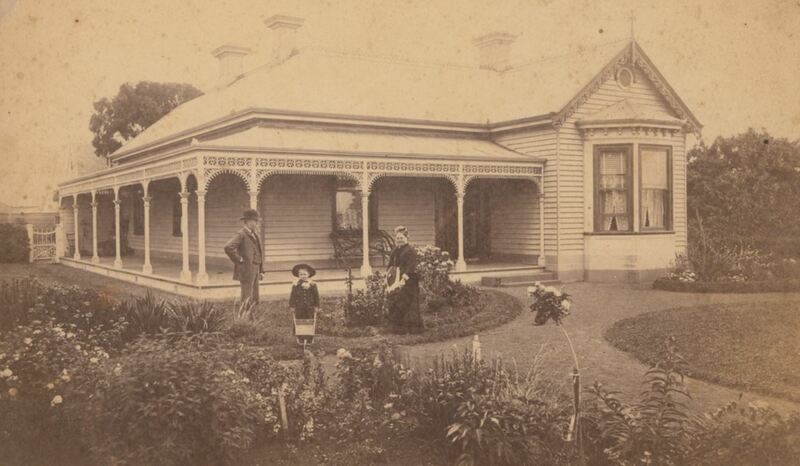 After ten years at Heywood, the Heaney’s moved on to Condah Swamp, later known as Wallacedale. Donald McINNES: Died 9 January 1924 at Warrnambool. Donald arrived on HMS Hercules after a horrendous voyage. His first job in Victoria was at the Kangaroo station near Hotspur owned by the McKinnon brothers, uncles of Donald. He never married. Thomas HERBERTSON: Died 17 January 1932 at Portland. The Herbertson family have a long association with Portland. Thomas was the son of Robert Herbertson an 1840s arrival at Portland. Thomas was eighty-one at the time of his death and during his years in Portland worked as a saddler, then owned a saddlery business, before purchasing Wattle Hill, where he farmed and ran a successful orchard with his sons. He married Jenny Miller of Portland and they had a family of five children. Frederick GUTHRIDGE: Died 16 January 1933 at Ullswater. Frederick Guthridge was a member of a large family well-known for their longevity. They featured in this week’s Trove Tuesday post for that reason. Frederick was the son of Richard Guthridge and Elizabeth Pitts. He married Alice Byrne and they had four sons and four daughters. Frederick also left eight brothers and sisters and a ninety-five year-old father. Joseph JACKSON: Died 16 January 1940 at Camperdown. Joseph Jackson was a native of Armagh County and spent most of his years in Victoria at Camperdown. A butcher by trade, he ran a successful business for nearly forty years. He was a committee member of the Camperdown Mechanics Institute and the Camperdown Turf Club. He was the longest-serving member of the Camperdown Bowling Club and had success locally and in Melbourne. Sarah Jane WADMORE: Died 1 January 1941 at Portland. Sarah Wadmore was a woman after my own heart. Sarah had a great interest in the history of Portland and with the approaching centenary of the town in 1934, she and two other local’s, Mrs W.F. Hedditch and Mr E. Davis of the Portland Observer produced a booklet entitled Portland Pioneer Women’s Book of Remembrance for the event. She was also the main force behind the Pioneer Women’s statue at Portland. Sarah’s obituary gives a detailed history of her life, including the loss of her father, a Cape Bridgewater pioneer, swept off the rocks when Sarah was only one month old. Sarah was a school teacher and never married. John Charles HAUGH: Died 12 January 1943 at Geelong. John Haugh was born at Bri Bri around 1866. In his early life, he went to Stoneyford, beginning work as a baker. He later worked for Camperdown baker, Mr G.Robertson. John was an original member of the Camperdown Brass Band and performed in local theatrical productions. He was a gate-keeper at the Camperdown Football oval for many years. 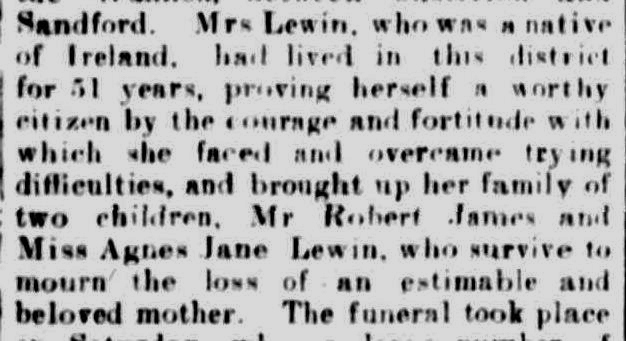 This entry was posted in Pioneer Obituaries and tagged Armstrong, Black, Dewar, Ferguson, Greenham, Gutheridge, Guthridge, Haugh, Heaney, Herbertson, Jackson, Kinnane, Lewin, Midgley, Morrissy, Ormsby, Sealey, Skilbeck, Thomas, Todd, Toodgood, Wadmore. Bookmark the permalink. I WAS INTERESTED TO READ THE PASSING OF THE PIONEERS . MY AUNT BEING SARAH JANE WADMORE,MUCH HAS BEEN TOLD OF THAT INTERESTING LADY IN THE WADMORE FAMILY. THE FAMILY HAD MANY VISITS TO ANNESLEY. NICE TO KNOW SHE IS NOT FORGOTTEN. AN INTERESTING READ.